So here is my progress so far on Butterfly Rest. During the first weekend we were home after Nathaniel was born, Allen’s dad came to visit. Granddad spent most of the weekend cuddling Nathaniel, so I was under strict orders that I should be cross stitching as much as I could. This is the fruit of that weekend. I am really proud of how much progress I have made on this. What a lovely start you’ve done there! Congrats!!! 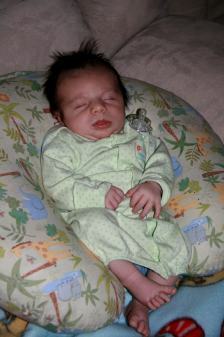 And Nathaniel is just adorable…none of my babies had any hair until they were 2 years old! So I wouldn’t be any help telling you what to do with it either…he’s a cutie tho’ with that rockin’ hair! You did wonderful for a weekend progress! Happy New Year – what a beautiful boy Nathaniel is ! Lovely progress on Butterfly Rest. Nathaniel is a real cutie. Awww, he’s cute and he sure does have a lot of hair! Great progress on Butterfly Rest. 🙂 Happy New Year! TeeHee… love that hair! Happy New Year!! What a cutie!! Our younger son had the same hairstyle. We called it Kevin Bacon hair. Every morning I have to spend about 5 minutes wetting and combing his hair before I take him to school. Of course, it is standing straight up by the time we get to school. It fits his personality. That’s a great start! No wonder you’re proud of yourself, you got loads done! Nathaniel is gorgeous and I do love that hair. Don’t do anything with it – it’s too cute to mess with or cut lol. LOL! That hairstyle is very “in” right now! Don’t do a thing to it! 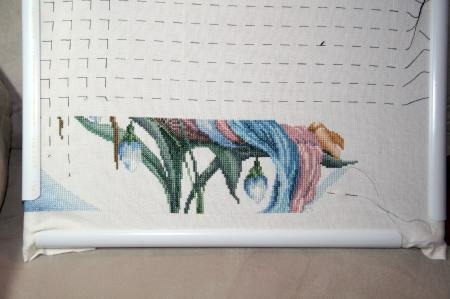 Great progress on Butterfly Rest – take advantage of any stitching time you get. Can’t wait to see your new start. Happy New Year Leslie! Nathaniel is looking great! I love your progress on Butterfly! And I love the latest pic of the littlest blogger. My son had hair like that too, he needed a haircut at birth! Wow! How do you do a many-colored pattern like that line by line? I imagine you have a bajilllion threads hanging off the back–or I would, all braided and tangled a spiderwebby! BTW, you other creative endeavor (i.e. motherhood) seems to be off to a rollicking start! Great start!! Nathaniel is sooo cute!